Remember my cami top from my recent ootd post? 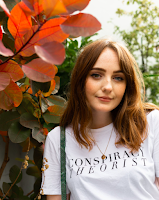 Well today I'm showing you a step by step tutorial on how to make your own cami top, which go for the likes of £18 in topshop! ♥a silky fabric, such as a soft polyester. Please note that I created these pattern pieces myself from scratch based on my figure (UK size 10) so you may feel the need to change these as necessary. Get someone to take your bust, hip and length measurements to adjust accordingly! Once you have your measurements, you can draw out your pattern pieces on the tracing paper or newspaper and cut these out. Try holding the pieces against you to see if you need to trim it or sellotape a piece on. 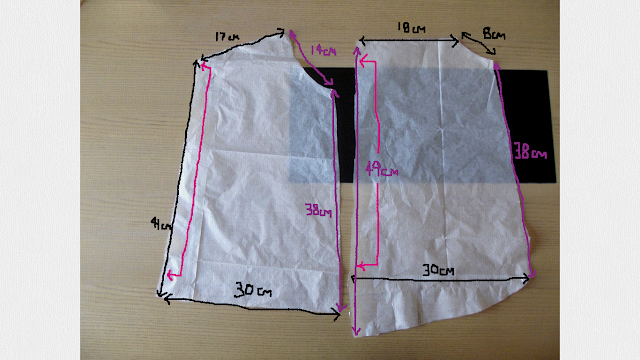 Remember, these measurements allow for seam allowances and the top should have a relaxed fit. When you're happy with your pattern, carefully pin it on your fabric along the centrefold (fold your fabric in half and place the edge of the pattern piece which would be the middle of the top at the fold, making sure it is the right way round). Try to use thin pins and don't keep them in the fabric for too long as to avoid needle damage. If this happens don't worry, a good press should get rid of the marks. Slowly cut around the pattern pieces and remove your pins. Place your pieces right side to right side (if one side is shinier than the other, this will be the right side) and fold the edges over and pin. You could also do a rolled seam, which I have done on the hem of the top and around the edges at the top. To do this you simply fold over again to hide the raw edges. But you should do the side seams first and them hem all of the edges as you please. Then you can turn your top from inside out to see how it's going. There should be no puckered seams! To avoid these pesky little so and so's, don't drag the fabric when you're sewing on the machine, patiently guide it through instead. Now all you need is the straps! I cut two pieces of my fabric 40cm long and 2cm wide. Remember, it's always better to make them too long first and then cut them down rather than make them too short! The easy way to make these skinny straps is to fold inwards from one side and iron this crease, then do the same on the other side. Like I've tried to show here in this picture. Then fold the strip in half lengthways so the raw edges are hidden. Pin this and sew on the machine. Make two of these (obviously) and hand sew them in place on the front of your cami. Pin the other ends to the back first and try the top on but mind those pins! If you need to shorten the straps then simply pin in place, if not then get hand sewing again! And that's that. You now have a beautiful cami top ideal for Summer! Will you guys be giving this a go? I'd love to see your creations! Also if you have any DIY requests please let me know and I'll get crack'a'lackin!